Original, quality 18th or early 19th century surface mounted brass door lock. Will take a standard modern square bar for the handles. A replacement keep has been made to suit with an old key altered to fit. This lock has the provision for a handle turn, a key lock and a security slide on the inside of the room, which overrides the handles and the key lock. Fully overhauled, polished and lacquered, although the lacquer may be removed at no extra cost. Complete and in good and working order. Lock 8.1/8" x 4.5" x 1". Original, quality 18th or early 19th century surface mounted brass door lock. Will take a standard modern square bar for the handles. A replacement keep has been made to suit. This lock has the provision for a handle turn, a key lock and a security slide on the inside of the room, which overrides the handles and the key lock and has a double throw to the lock. Fully overhauled, polished and lacquered, although the lacquer may be removed at no extra cost and complete and in good and working order. Lock 6.5" x 3.75" x 1". Original, quality late 18th / early 19th century surface mounted brass door lock, will take a standard modern square bar for the handles. Replacement keep made to suit and an old key altered to fit. This lock has the provision for a handle turn, a key lock and a security slide on the inside of the room, which overrides the handles and the key lock. This lock also has concealed fixings, so when mounted no screws are visible and has a double throw to the lock. Fully overhauled, polished and lacquered, although the lacquer may be removed at no extra cost and is complete and in good and working order. Lock 7.75" x 4.5" x 1". Original, quality 18th or early 19th century surface mounted brass door lock; will take a standard modern square bar for the handles. A replacement keep has been made to suit and an old key altered to fit. This lock has the provision for a handle turn, a key lock and a security slide on the inside of the room, which overrides the handles and the key lock and the lock has a double throw to the lock. Fully overhauled, polished and lacquered, although the lacquer may be removed at no extra cost and complete and in good and working order. Lock 7" x 4" x 1". Original, quality 18th or early 19th century surface mounted brass door lock; will take a standard modern square bar for the handles. A replacement keep has been made to suit and an old key altered to fit. This lock has the provision for a handle turn, a key lock and a security slide on the inside of the room, which overrides the handles and the key lock and the lock also has concealed fixings, so when mounted no screws are visible and has a double throw to the lock. Fully overhauled, polished and lacquered, although the lacquer may be removed at no extra cost and is complete and in good and working order. Lock 7" x 4" x 7/8". Original, quality 18th or early 19th century surface mounted brass door lock; will take a standard modern square bar for the handles. A replacement keep has been made to suit and an old key altered to fit. This lock has the provision for a handle turn, a key lock and a security slide on the inside of the room, which overrides the handles and the key lock. This lock also has concealed fixings, so when mounted no screws are visible. Fully overhauled, polished and lacquered, although the lacquer may be removed at no extra cost and complete and in good and working order. Lock 7" x 4" x 0.75". Original, quality 18th or early 19th century surface mounted brass door lock. Will take a standard modern square bar for the handles, with a replacement keep and an old key altered to fit. This lock has the provision for a handle turn, a key lock and a security slide on the inside of the room, which overrides the handles and the key lock. This lock also has concealed fixings, so when mounted no screws are visible and a double throw to the lock. Fully overhauled, polished and lacquered, although the lacquer may be removed at no extra cost and all is complete and in good and working order. Lock 7" x 3.75" x 0.75". Original, quality 18th or early 19th century surface mounted brass door lock. Will take a standard modern square bar for the handles,with a replacement keep and an old key altered to fit. This lock has the provision for a handle turn, a key lock and a security slide on the inside of the room, which overrides the handles and the key lock. This lock also has concealed fixings, so when mounted no screws are visible and this lock has a double throw to the lock. Fully overhauled, polished and lacquered, although the lacquer may be removed at no extra cost and all is complete and in good and working order. Lock 8" x 4.5" x 1". 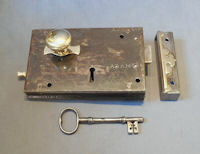 Original, quality late 19th century surface mounted brass rim lock with the original brass key and keep. Will take a standard modern square bar for the handles and this lock has the provision for a handle turn and a key lock. 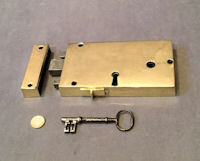 This super heavy example has an all brass internal mechanism as well as the outer case and key. Fully overhauled, polished and lacquered, although the lacquer may be removed at no extra cost and is complete and in good and working order. Lock 8 1/8" x 5.5" x 1 1/8". Original, quality 18th or early 19th century surface mounted brass door lock. Will take a standard modern square bar for the handles. This lock has the provision for a handle turn, a key lock and a security slide on the inside of the room, which overrides the handles and the key lock. 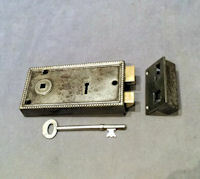 A replacement keep has been made to suit, the original key is included lock has a double throw to the lock. Fully overhauled, polished and lacquered, although the lacquer may be removed at no extra cost and all is complete and in good and working order. Lock 8" x 4.5" x 1". 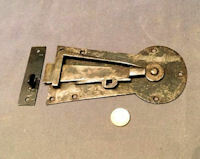 Original, quality large 18th or early 19th century surface mounted door lock. Will take a standard modern square bar for the handles. This lock has the provision for a handle turn, a key lock and a security slide on the inside of the room, which overrides the handles and the key lock. The file marks are the original to when the lock was manufactured. With a replacement keep and an old key altered to fit. Fully overhauled, cleaned and lacquered and is complete and in good and working order. Lock 8" x 4.75" x 1.25". Original, quality late 19th century surface mounted small wrought iron rim lock with a brass fittings will take a standard modern square bar for the handles. This lock has a sliding knob action to one side with a lock on / lock off sliding bolt, has a key facility from the other side only, so working on a cabin lock principle. This lock can be used on both left and right handed doors. Fully overhauled, cleaned and lacquered and all is complete and in good and working order. Lock 4" x 3.5" x 0.75". Original, quality 1920's surface mounted wrought iron door lock. Will take a standard modern square bar for the handles. 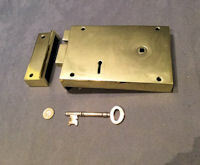 A replacement keep and key made to suit and this lock has the provision for a handle turn and a key lock. Fully overhauled, cleaned and lacquered and complete and in good and working order. Lock 6" x 4" x 7/8". Original, quality cast iron surface mounted door lock with a decorative beaded border. A replacement keep and key has been made to suit. This lock will take a standard modern square bar for the handles and has the provision for a handle turn and a key lock and has been cleaned and lacquered and fully overhauled. The reverse of the brass locking bar is impressed with patent number for the year 1926. Complete and in good and working order. Lock 5.5" x 2.75" x 7/8". Original, quality 18th or early 19th century surface mounted brass door lock.Will take a standard modern square bar for the handles. A replacement keep has been made to suit, and it has the original key. This lock also has the provision for a handle turn, a key lock and a security slide on the inside of the room, which overrides the handles and the key lock. This lock also has concealed fixings, so when mounted no screws are visible and a double throw to the lock. Has been polished and lacquered, although the lacquer may be removed at no extra cost and all is complete and in good and working order. Lock 8" x 4.5" x 1.25". Original, quality late 19th century surface mounted wrought iron door lock with the original key, to take a standard modern square bar for the handles. 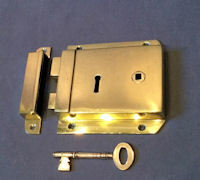 A replacement keep has been made to suit and this lock has the provision for a handle turn and a key lock. The file marks are the original to when the lock was manufactured. Not suitable for oval shaped door knobs. Cleaned and lacquered, fully overhauled and complete and in good and working order. Lock 6" x 4.25" x 1". Original, quality late 19th century surface mounted wrought iron door lock with the original key, to take a standard modern square bar for the handles. 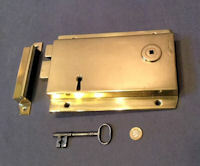 A replacement keep has been made to suit and this lock has the provision for a handle turn and a key lock. The file marks are the original to when the lock was manufactured. Not suitable for oval shaped door knobs. Cleaned and lacquered, fully overhauled. All is complete and in good and working order. Lock 6" x 4.25" x 1". 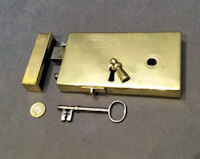 Original, quality circa 1900, surface mounted door lock with brass mounts to take a standard modern square bar for the handles and this lock has the provision for a handle turn and a key lock. A replacement keep and key have been made to suit . The file marks are the original to when the lock was manufactured. Cleaned and lacquered, fully overhauled and is complete and in good and working order. Lock 6" x 4" x 0.75". 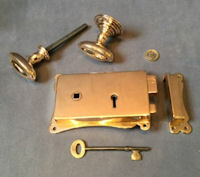 Original, quality circa 1900, surface mounted door lock with brass mounts and the original key. To take a standard modern square bar for the handles and a replacement keep has been made to suit and this lock has the provision for a handle turn and a key lock. The file marks are the original to when the lock was manufactured. Cleaned and lacquered, fully overhauled and is complete and in good and working order. Lock 6" x 4" x 0.75". Original, quality late 18th or early 19th century, surface mounted cast brass door lock to take a standard modern square bar for the handles, with the original key. A replacement keep has been made to suit. This lock has the provision for a handle turn, a key lock and a security slide on the inside of the room, which overrides the handles and the key lock. This lock has concealed fixings, so when mounted no screws are visible and has a double throw to the lock. Has been fully overhauled, polished and lacquered, although the lacquer may be removed at no extra cost. Complete and in good and working order. Lock 7" x 4" and 1" front to back. Original, quality late 19th century cast pink brass surface mounted door lock with the original cast brass keep, key and pair of drop ring handles. Both the lock and the handles are stamped for the manufacturer "Gibbons of Wolverhampton". This super lock and keep have a flange all around with the screw holes for mounting, and the lock has a decorative serpentine shaped flange to the end. Will take a standard modern square bar for the handles and has the provision for a handle turn and a key lock. Fully overhauled, polished and lacquered, although the lacquer may be removed at no extra cost. The handles are not lacquered, but are included in the set for this lock, keep, key and handles have been together since new. A fabulous set by a well respected manufacturer. Original, quality 1920's small cast brass surface mounted door lock. Will take a standard modern square bar for the handles. With an old key altered to fit and a replacement keep made to suit. This lock has the provision for a handle turn and a key lock. Has been fully overhauled, polished and lacquered, although the lacquer may be removed at no extra cost. Ideal for a bathroom door and is complete and in good and working order. Lock 3.75" x 2.5". 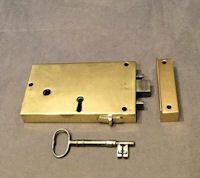 Original, quality 1920's surface mounted cast brass rim lock with an outer flange top and bottom. Will take a standard modern square bar for the handles. A replacement keep has been made to suit and a replacement key cut to fit and this lock has the provision for a handle turn and a key lock. This larger than average door lock has been fully overhauled, polished and lacquered, although the lacquer may be removed at no extra cost and all is complete and in good and working order. Lock 7.5" x 4.5" and 1.5" front to back. Original, quality late 19th century surface mounted door latch. To take a standard modern square bar for the handles. 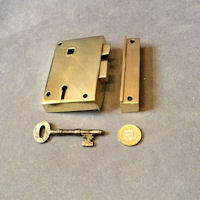 A replacement keep has been made to suit and this lock has the provision for a handle turn and a privacy slide. 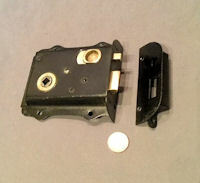 This latch can be used on both left and right handed doors. Not suitable for oval shaped door knobs. Fully overhauled, cleaned and lacquered and complete and in good and working order. Main Body 4.5" x 3.5" x 0.75". Original, quality circa 1900 / 1920's surface mounted wrought iron door lock. To take a standard modern square bar for the handles. 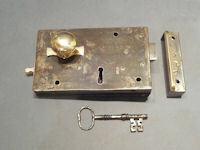 A replacement keep has been made to suit, an old key altered to fit and this lock has the provision for a handle turn and a key lock. The file marks are the original to when the lock was manufactured. Not suitable for oval shaped door knobs. Fully overhauled, cleaned and lacquered and complete and in good and working order. Lock 6" x 4" x 0.75". Original, quality, circa 1900, cast iron surface mounted door lock. Will take a standard modern square bar for the handles. A replacement keep has been made to suit and a replacement key cut to fit. This lock has the provision for a handle turn and a key lock and can be used on both left and right handed doors. Fully overhauled, cleaned and lacquered and complete and in good and working order. Lock 5.25" x 3.25" x 1". Original, quality late 18th or early 19th century, surface mounted cast brass door lock to take a standard modern square bar for the handles. A replacement keep has been made to suit and an old key altered to fit. This lock has the provision for a handle turn, a key lock and a security slide on the inside of the room, which overrides the handles and the key lock and has a double throw to the lock. Fully overhauled, polished and lacquered, although the lacquer may be removed at no extra cost. Complete and in good and working order. 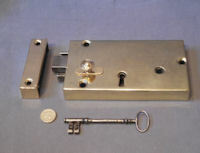 Lock 6.75" x 3.75" and 1" front to back. Original, quality 1920's / 30's surface mounted steel door latch with brass mounts. Will take a standard modern square bar for the handles. A replacement keep has been made to suit. This latch has the provision for a handle turn and a security slide on the inside of the room, which overrides the handles and can be used on both left and right handed doors. Repainted, fully overhauled and complete and in good and working order. Latch 4.75" x 4.25" x 0.75". Original, quality 1920's / 30's surface mounted steel door latch with brass mounts. Will take a standard modern square bar for the handles. A replacement keep has been made to suit and this latch has the provision for a handle turn and a security slide on the inside of the room, which overrides the handles and can be used on both left and right handed doors. Repainted, fully overhauled and complete and in good and working order. Latch 4.75" x 4.25" x 0.75". Original, quality circa 1900, cast pink brass surface mounted rim latch / lock. This very unusual example patented and manufactured by "Gibbons of Wolverhampton" is impressed as such to the foreplate of the lock. 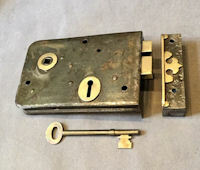 This lock has an Art Nouveau shaped flange all round with four countersunk screw holes to the lock, two to the replacement keep made to suit and two to the foreplate and a replacement key cut to fit. Will take a standard modern square bar for the handles and has the provision for a handle turn and a key lock. Fully overhauled, polished and lacquered, although the lacquer may be removed at no extra cost and complete and in good and working order. The locking mechanism uses the latch principle as well as the key and handle. The first we have seen! Lock 5.5" x 3" x 0.75". 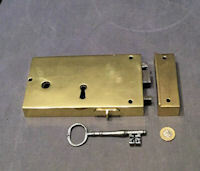 Orginal, quality late 19th century surface mounted brass door lock. A replacement keep has been made to suit but has the original brass key. This lock has the provision for a handle turn and a key lock and has flanges to the top and bottom of the main body, each flange has two countersunk screw holes for mounting. The top flange is stamped for the manufacturer "W.Mc Geogh and Co Glasgow". Fully overhauled, polished and lacquered, although the lacquer may be removed at no extra cost and complete and in good and working order. Lock 6" x 5.5" x 1 1/8" front to back. 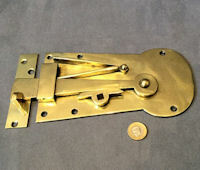 Original, quality late 19th century surface mounted brass door lock of unusual proportions. This near square example will take a standard modern square bar for the handles. 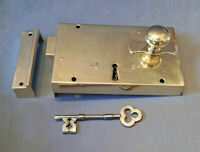 A replacement keep has been made to suit, an old key altered to fit and this lock has the provision for a handle turn and a key lock. Fully overhauled, polished and lacquered, although the lacquer may be removed at no extra cost and complete and in good and working order. Lock 5.75" x 6" wide and 0.75" front to back. 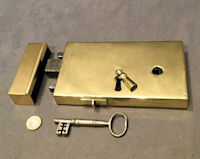 Original, quality late 19th century large surface mounted heavy brass door lock, to a standard modern square bar for the handles. 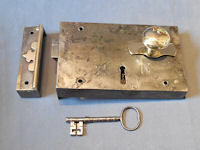 A replacement keep has been made to suit, an old key altered to fit and this lock has the provision for a handle turn and a key lock. Fully overhauled, polished and lacquered, although the lacquer may be removed at no extra cost and complete and in good and working order. A most unusual sized lock. Lock 9.75" x 7" x 1.25" front to back. Original, quality 18th or early 19th century surface mounted brass door lock, to take a standard modern square bar for the handles. 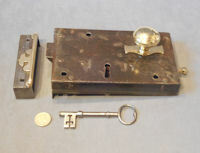 A replacement keep has been made to suit, an old key altered to fit and has the provision for a handle turn, a key lock and a security slide on the inside of the room, which overrides the handles. The key lock has a double throw to the lock. All has been fully overhauled, polished and lacquered, although the lacquer may be removed at no extra cost and is complete and in good and working order. Lock 7.75" x 4.25" x 1" front to back. 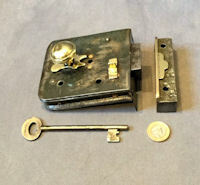 Original, quality 1920's surface mounted cast brass door lock with the original brass key. To take a standard modern square bar for the handles. 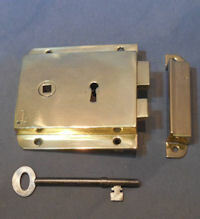 A replacement keep has been made to suit and this lock has the provision for a handle turn and a key lock. Fully overhauled, polished and lacquered, although the lacquer may be removed at no extra cost. The top mounting flange is stamped for the maker " W. Mc Geogh & Co Glasgow" and "Secure 4 Lever". 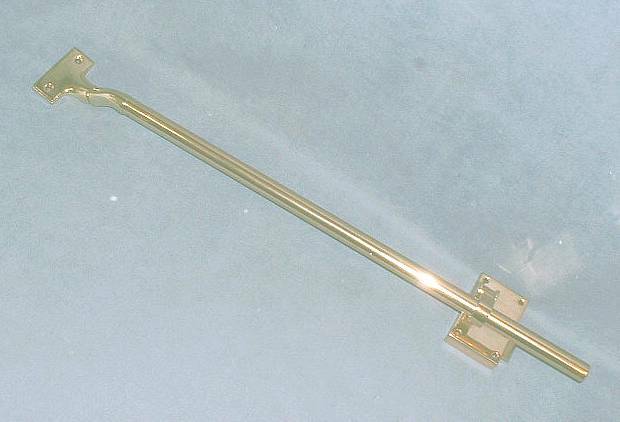 This complete lock and keep and key are in brass to ensure it does not spark and can be used in a fire risk area such as a stable block, ammunition store or similar. Complete and in good and working order. Lock including flanges 5.75" wide x 5.5" tall and 1" front to back. Original, quality 1920's surface mounted cast brass door lock, to take a standard modern square bar for the handles and with the provision for a handle turn and a key lock. A replacement key has been cut to fit and a replacement keep made to suit. The lock is engraved to the end plate "Quiggins Liverpool" for the maker and "2 Lever". Fully overhauled, polished and lacquered, although the lacquer may be removed at no extra cost and complete and in good and working order. Lock 6" x 3.25" x 0.75". Original, quality late 19th century larger than average surface mounted wrought iron door lock. To take a standard modern square bar for the handles. 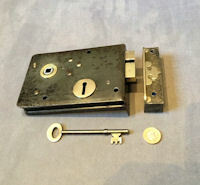 A replacement keep have been made to suit, an old key altered to fit and this lock has the provision for a handle turn and a key lock. The file marks are the original to when the lock was manufactured. Fully overhauled, cleaned and lacquered and complete and in good and working order. Lock 8" x 5" x 1" front to back. 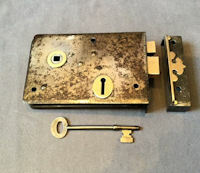 Original, quality 1920's surface mounted wrought iron door lock, to take a standard modern square bar for the handles. 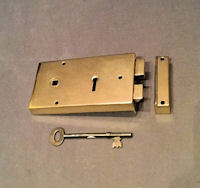 A replacement keep and key has been made to suit and this lock has the provision for a handle turn and a key lock. Has been cleaned and lacquered, fully overhauled and is complete and in good and working order. Lock 6" x 4" x 1". 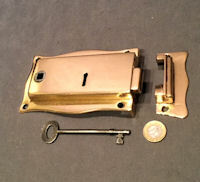 Original, quality circa 1900, pink cast brass surface mounted door lock manufactured by Elsleys and Co in the Art Nouveau style. A replacement key and keep have been made to suit and the original pair of matching oval pink brass door handles are included. The lock and keep have a decorative flange all around, screw holes for mounting. The lock is not marked for Elsleys but we believe it was manufactured by them, and the patent adjustment handles are impressed to the reverse "Elsley's Patent". All has been fully overhauled, polished and lacquered, although the lacquer may be removed at no extra cost and is complete and in good and working order. Lock backplate 6" x 4" x 7/8" front to back. Knob backplate 2.25" diam, handle 2.5" x 1.25" and 2.5" front to back. A second identical set may well be available with a different key of course. Price is per set. 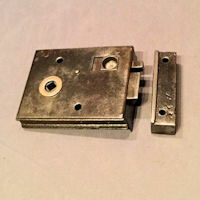 Original, quality 1920's, cast brass surface mounted door lock, with a mounting flange to the top and bottom, each with two countersunk screw holes for mounting. Will take a standard modern square bar for the handles and has the provision for a handle turn and a key lock. A replacement keep has been made to suit and a replacement key cut to fit. Fully overhauled, polished and lacquered, although the lacquer may be removed at no extra cost and complete and in good and working order. 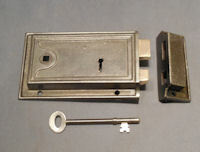 Lock 4.5" x 4.25" and 0.75" front to back. Original, quality late 19th century surface mounted wrought iron door lock, to take a standard modern square bar for the handles. With the original key and a replacement keep made to suit. 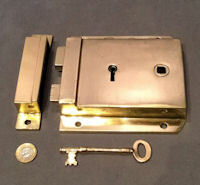 This lock has the provision for a handle turn and a key lock and has been cleaned and lacquered. The file marks are the original to when the lock was manufactured. Fully overhauled and complete and in good and working order. Lock 6" x 4" x 0.75". 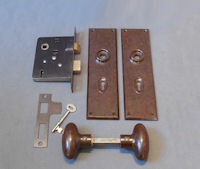 Original, quality 1920's surface mounted wrought iron door lock, to take a standard modern square bar for the handles. A replacement keep has been made to suit and a replacement key cut to fit. This lock has the provision for a handle turn and a key lock and has been cleaned and lacquered. All has been fully overhauled and is complete and in good and working order. Lock 6" x 4" x 1". Original, quality, early to mid 19th century, blacksmith made wrought iron surface mounted door lock, to take a standard modern square bar for the handles. With the original key and a replacement keep made to suit. This lock has the provision for a handle turn and a key lock and has been cleaned and lacquered. The file marks are the original to when the lock was manufactured. Fully overhauled and complete and in good and working order. Lock 7" x 5" x 0.75". Original, quality 19th century surface mounted wrought iron door lock with brass mounts, to take a standard modern square bar for the handles. A replacement keep has been made to suit and an old key altered to fit. This lock has the provision for a handle turn and a key lock, has been cleaned and lacquered but is not suitable for oval shaped door knobs. The file marks are the original to when the lock was manufactured. Fully overhauled and complete and in good and working order. Lock 7" x 4.5" x 1". Original, quality 1920's, surface mounted wrought iron door lock with brass mounts, to take a standard modern square bar for the handles, with a replacement keep made to suit and a replacement key cut to fit. This lock has the provision for a handle turn and a key lock. Fully overhauled and complete and in good and working order. Lock 6.25" x 4" x 1". Original, quality 19th century surface mounted wrought iron door lock with brass mounts, to take a standard modern square bar for the handles. A replacement keep has been made to suit and an old key altered to fit. This lock has the provision for a handle turn and a key lock. Has been cleaned and lacquered but is not suitable for oval shaped door knobs. The file marks are the original to when the lock was manufactured. Fully overhauled and complete and in good and working order. Lock 6" x 4.5" x 0.75". Original, quality late 18th or early 19th century surface mounted brass door lock, to take a standard modern square bar for the handles. A replacement keep has been made to suit and an old key altered to fit. This lock has the provision for a handle turn, a key lock and a security slide on the inside of the room, which overrides the handles and the key lock. This lock has a double throw to the lock and all has been fully overhauled, polished and lacquered, although the lacquer may be removed at no extra cost. Complete and in good and working order. Lock 8" x 4.5" x 1.1/8". Original, quality late 18th or early 19th century surface mounted brass door lock, to take a standard modern square bar for the handles. A replacement keep has been made to suit and an old key altered to fit. This lock has the provision for a handle turn, a key lock and a security slide on the inside of the room, which overrides the handles and the key lock. This lock has a double throw to the lock and all has been fully overhauled, polished and lacquered, although the lacquer may be removed at no extra cost. Complete and in good and working order. Lock 7" x 4" 1". Keep 4" x 1". Original, quality late 18th or early 19th century surface mounted brass door lock, to take a standard modern square bar for the handles. A replacement keep has been made to suit and an old key altered to fit. This lock has the provision for a handle turn, a key lock and a security slide on the inside of the room, which overrides the handles and the key lock. This lock has a double throw to the lock and all has been fully overhauled, polished and lacquered, although the lacquer may be removed at no extra cost. Lock 6.75" x 4" and 7/8" front to back. 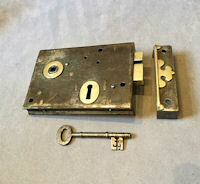 Original, quality surface mounted nickel door lock circa 1900, with the original keep and drop ring handle, a replacement key cut to fit and an oval nickel door knob to suit, this lock has the provision for a handle turn and a key lock. This superb lock and keep has a decorative flange all round with a pierced design of hearts and the lock has six screw holes for mounting and the keep has four. The lock fore end is impressed for the manufacturer " George Wragge Manchester ". A most unusual lock. All has been fully overhauled and has been polished and lacquered, although the lacquer may be removed at no extra cost. All is complete and in good and working order. Lock 7" x 6.25" tall and 1" front to back. Keep 1.75" x 6.25" tall and 1" front to back. Price is for the set. Original, quality early 19th century small surface mounted brass door lock to take a standard modern square bar for the handles. A replacement keep has been made to suit and an old key altered to fit. This lock has the provision for a handle turn, a key lock and a security slide on the inside of the room, which overrides the handles and the key lock. All has been fully overhauled, polished and lacquered, although the lacquer may be removed at no extra cost and is complete and in good and working order. Lock 5.5" x 3.25" x 0.5". Original, quality 1920's, pressed steel surface mounted door lock to take a standard modern square bar for the handles, with a replacement keep made to suit and a replacement key cut to fit. This lock has the provision for a handle turn and a key lock. Each side is stamped "Reversible Bolt Patent Applied For". Fully overhauled, repainted and complete and in good and working order. 5.5" x 2.75" and 0.75". Original, quality, early to mid 19th century, blacksmith made wrought iron surface mounted door lock, with a replacement keep made to suit and an old key altered to suit. This lock has a sliding brass knob operated from the inside of the room only and a key lock operated from both inside and out. A brass security slide to the end of the lock will overide all other action from inside of the room. The handle slide and the key operates the same tongue and the key overides the handle action. This lock has brass fittings to both the keep and lock and has been fully overhauled, cleaned and finished in a coat of clear lacquer. 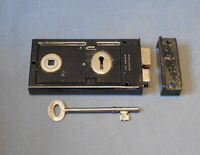 Lock 7" x 4.25" and 1". 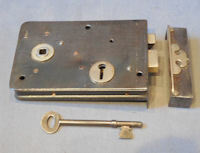 Two other matching locks very similar may well be available reference code RL557 and RL619. Original, quality, early to mid 19th century, blacksmith made wrought iron surface mounted door lock, with a replacement keep made to suit and an old key altered to suit. This lock has a sliding brass knob operated from the inside of the room only and a key lock operated from both inside and out. A brass security slide to the end of the lock will overide all other action from inside of the room. The handle slide and the key operates the same tongue and the key overides the handle action. This lock has brass fittings to both the keep and lock and has been fully overhauled, cleaned and finished in a coat of clear lacquer. Lock 7" x 4.25" and 1". 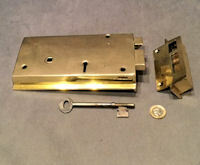 Two other matching locks very similar may well be available reference code RL558 and RL619. Original, quality, surface mounted cast iron door lock, circa 1900, to take a standard modern square bar for the handles. A replacement keep has been made to suit and a replacement key cut to fit. This lock has the provision for a handle turn and a key lock and has been fully overhauled, cleaned, lacquered and complete and in good and working order. 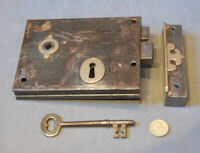 Lock 6" x 3.75" and 0.75". 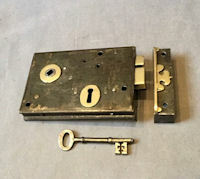 Original, quality, early 19th century, all brass larger than average surface mounted door lock, with a replacement keep made to suit and a replacement key cut to fit. This superb example has a sliding brass knob operated from the inside of the room only and a key lock operated from both inside and out. The handle slide and key operate the same tongue and the key overides the handle action. Fully overhauled, polished and lacquered, although the lacquer may be removed at no extra. 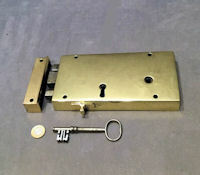 A super lock, the first we have seen of this form in brass. Incidentally apart from the springs all the internal mechanism is in brass. Lock 10" x 6" and 1.5". Original, quality, mid 19th century, blacksmith made wrought iron surface mounted door lock, with a replacement keep made to suit and an old key altered to fit. This lock has a sliding brass knob operated from the inside of the room only and a key lock operated from both inside and out. The handle slide and key operate the same tongue and the key overides the handle action. Fully overhauled, cleaned and finished in a coat of clear lacquer. 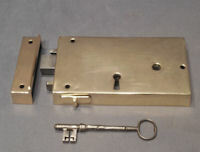 Lock 9" x 5.75" and 1.5", keep 5.75" x 1.5" + 1.75". Original, quality, late 19th century, surface mounted wrought iron door lock, with the provision for a handle turn and a key lock and will take a standard modern square bar for the handles. A replacement keep has been made to suit and a replacement key cut to fit. Fully overhauled, cleaned, lacquered and complete and in good and working order. 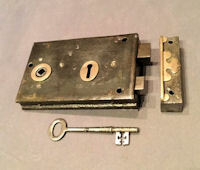 Lock 6" x 4.75" and 1". Original, quality, wrought iron surface mounted door lock, circa 1900, with brass mounts. This lock has the provision for a handle turn and a key lock and will take a standard modern square bar for the handles. 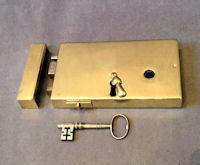 A replacement keep has been made to suit and a replacement key cut to fit and all has been repainted with the brass polished and lacquered, although the lacquer may be removed at no extra cost. Complete and in good and working order. 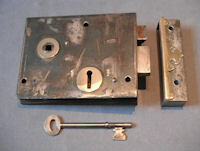 Lock 6" x 4.5" and 0.75". Original, quality, late 19th century, cast brass surface mounted door lock, with the provision for a handle turn and a key lock. Has the original keep and a replacemnt key cut to suit. This lock has a beaded flange to all sides, including the keep. The lock has four screw holes for mounting and the keep has three, the faceplate of the lock is impressed for the manufacturer in Gothic style type "Gibbons Maker Wolverhampton". Fully overhauled, polished and lacquered, although the lacquer may be removed at no extra cost. Complete and in good and working order. Lock 6.75" x 5" and 0.75", keep 5" x 1.75". Original, quality, late 19th century, surface mounted door lock, with no provision for a handle, just a key locking from both sides. A replacement keep made to suit and a replacement key has been cut to fit. Repainted, fully overhauled and complete and in good and working order. Lock 7" x 4.5" and 1". 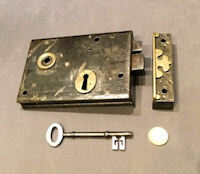 Original, quality, early to mid 19th century, surface mounted wrought iron, door lock with the original key and a replacement keep which has been made to suit. This lock has the provision for a handle turn, a key lock and a security slide on the inside of the room, which overrides the handles and the key lock and will take a standard modern square bar for the handles. Fully overhauled, cleaned, lacquered and complete and in good and working order. Lock 6.25" x 4" and 1". 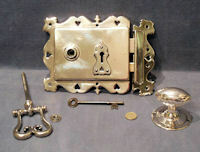 Original, quality 1920's, silver plated surface mounted door lock, with a replacement keep and key made to suit. Will take a standard modern square bar for the handles and has the provision for a handle turn and a key lock and the fore end is impressed "Hope Birmingham" for the manufacturer. Polished and lacquered, although the lacquer may be removed at no extra cost, fully overhauled and complete and in good and working order. Lock 6.25" x 3" x 0.75", keep 1.5" x 3". 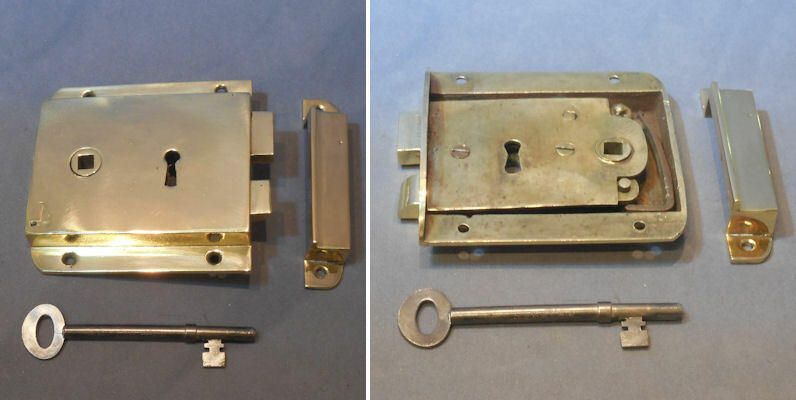 Original, quality, late 19th century, surface mounted brass door lock, with a replacement keep made to suit and the original key. This example has a key action only and will not take a handle. Fully overhauled, polished and lacquered, although the lacquer may be removed at no extra cost. Complete and in good and working order. Lock 7" x 4" x 0.75". Original quality cast iron surface mounted door lock with a decorative flange around with a replacement keep made to suit and an original key. Stamped to the reverse of the lock with the registration number for the year 1906. Has been fully overhauled and repainted and is complete and in good and working order. Lock 7" x 5". Pair of original, quality 1930's, unused bakelite door handles with the original backplates, mortice lock and key, keep, screws and card box, however it is missing the lid to the box, otherwise all is in superb condition, fully overhauled and in complete and working order. The lock is impressed "Legge 2 Lever" and the reverse of the bakelite backplates to the handles are embossed "RIS Registered Trade Mark, Made in England". Knobs 2.5" x 1.25", backplate 8" x 2.25" + 2" front to back, lock 3.75" x 3" + 0.5". Price is for the set. Pair of original, quality, white bakelite lever door handles, with sprung and shaped lever handles, long cushioned backplates, each with a keyhole and four countersunk screw holes for mounting, the original steel mortice lock, keep, square bar and key. The replacement key has been cut to suit, the lock has been fully overhauled and has a patent reversible bolt. A most unusual find. Each lever handle is embossed behind, with the registration number for the year 1938. A little damage to one backplate, otherwise all is complete and in good and working order. Handle backplate 7.25" x 2.25", all handle 5" wide x 2.5" front to back, lock body 3.75" x 3" and 3/8", lock plate 5.5" x 7/8". Price is per set. Original, quality late 19th century, all brass surface mounted door latch set. This most unusual example has a shaped backplate with six countersunk screw holes for mounting and the replacement keep made to suit has four. This is handed as in the picture. Polished and lacquered, although the lacquer may be removed at no extra cost and is complete and in good and working order. Backplate 8" x 4" total. 9.5" x 4" total. Keep 4.5" x 1". Price is for the set. 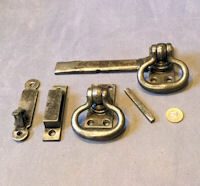 Original, quality 1920's five piece cast iron door latch set with drop ring handles, each with rectangular backplates with four countersunk screw holes for mounting. One ring handle is fitted to the latch bar and all has been cleaned and lacquered and is complete and in good and working order. Backplates 3" x 1.5". Ring handles 3" wide and 2.75" tall. Original, quality late 19th century blacksmith made wrought iron surface mounted door latch with a replacement keep made to suit. This unusual example has an exposed sprung latch mechanism to take a standard modern square bar for the handles. Fully overhauled, cleaned and lacquered and complete and in good and working order. Latch 7.5" x 4" x 0.5" front to back. Original quality, 1920/30's, 'panic bar' door lock for a fire escape door. 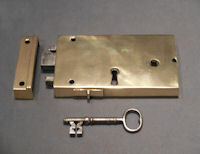 The lock and bar are in pink brass and the hinged mounting plate in yellow. The reverse of the lock is marked 'Made in England'. Will fit both right and left hand opening doors. Polished, lacquered and complete and in good and working order. Bar and mount 27" long, lock 2.5" x 3.5". Price is for each.